When you are running an e-commerce store based on WordPress, figuring out how to translate WooCommerce products can be a crucial factor. Offering your store in several languages is a great way to extend your reach and win over new customers. Thanks to the Internet, these days any online shop can compete globally. If you put your wares online, you can sell to worldwide customers – at least theoretically. In reality, that doesn’t always happen and one of the main reasons for that is whether you have your site translated or not. As it turns out, language is a major selling factor. 56.2 percent of consumers state that the ability to get product information in their own language is more important to them than price. As a consequence, if you translate your offerings (and the rest of your site) into the language of your visitors, you dramatically increase your chances of turning them into paying customers. This article will tell you exactly how to do that. 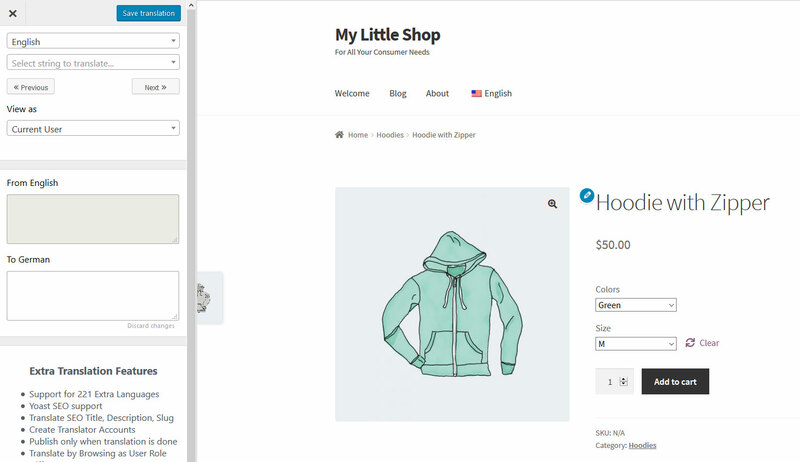 In the following, we will go over how to translate different parts of your WooCommerce products including product title, description and category. 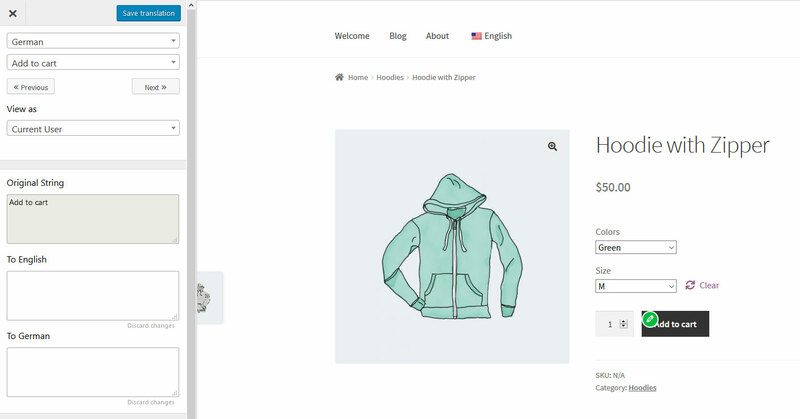 You will also learn how to translate product attributes of variable products, strings included in the WooCommerce plugin as well as the product URL and page title. In order to translate WooCommerce products, you need a few things. Naturally, the first prerequisite is that you have set up your e-commerce site with WooCommerce. Secondly, to follow the steps in this tutorial, you also need to have TranslatePress installed. You can find it for free in the WordPress directory. To install it from the WordPress back end, simply go to Plugins > Add New and search for it by name. When you find it in the list, click the Install Now button to get it onto your site. When the plugin is done downloading, don’t forget to activate it. After that, you are good to go. Just one quick note: for some parts of this tutorial, you also need the SEO Pack (included in TranslatePress Premium). However, I will let you know about that when we get to it. First, at the top of the screen, pick your default language. After that, under All Languages, you are able to add more. Use the drop-down menu to choose one from the list. 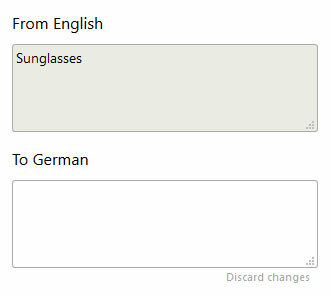 In my case, I want German as my site’s second language. Save any changes at the bottom and you are done. After this, you are ready to start translating. 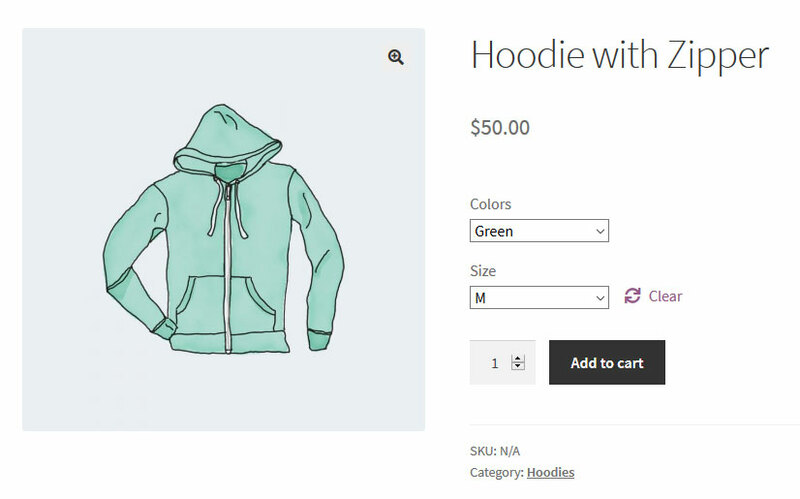 The first thing we will do is add new language options to a normal WooCommerce product. Here’s how to do that. The first thing to do to translate a single product is to go to the front end of your site and open it in your browser. For this example, we want to translate the sunglasses on the right. To do so, the first thing you would do is click on them. After that, hit Translate Page in the WordPress admin bar. This gets you to the main translation screen. The first thing you want to do here is using the drop-down menu at the very top left to choose the language you are translating into. This way, you will be able to see the changes on your site instantly. When you now hover over the product name, a little icon appears. Click it and you will see the original string on the left in the From English box. To add a translation for another language, simply insert it into the box at the bottom, which is for the language you will be translating into. When you then hit Save Translation at the top, the page will automatically show the title on the page in the second language. Moving on from here, you can do the same thing with the product’s short description, description and product category. 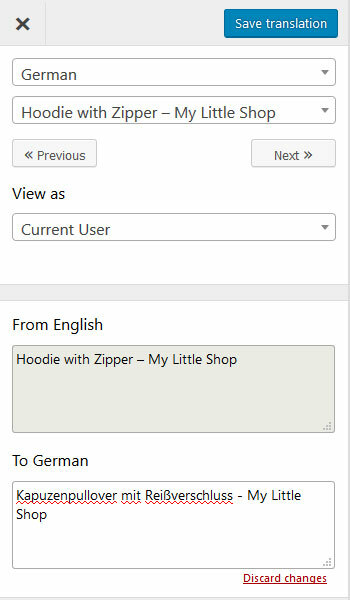 Simply hover over the part you want to localize, click the edit button, add a translation and save. Yet, there are also alternative ways to achieve this. For one, you can use the string list (right below where you pick the language) to choose any of the strings on the page for translating. This way, you don’t manually have to look around the page to see what else needs to be localized and can also make sure you catch everything. Even easier than that, use the Next and Previous buttons to cycle through all available strings. In addition to the above, you can also use TranslatePress to translate variable products. These are products that can come with different attributes such as color and size. Adding more language options to them works pretty much the same way. Just create a variable product and enter the translation options. When you have done that, you can find any product attributes under Additional information. Here, simply start translating them by hovering over and clicking the edit button. For convenience’s sake, you can also cycle through the attributes with the Previous and Next buttons. The same works for any tags you might have added. However, in the course of doing all of this, you might have noticed that there are a bunch of strings on your pages that are still in the original language. These are all the things that WooCommerce adds automatically and that you can not edit from the product page or similar. Examples include the Add to Cart button or the content of the drop-down menus to choose different variants. Usually, you would have to modify these inside theme or plugin files but TranslatePress also helps you take care of this part. It just works slightly differently. The beginning is the same. Simply hover over what you want to change and click the edit button. The first thing you will notice that the icon is green in this case. That’s how you understand that this string is coming from a theme or plugin. Another thing that is obvious is when you click, you get more fields to add translations to, including one for your default language. This is quite useful, as it allows you to change strings coded into WooCommerce directly. If you are not satisfied with the choice of words, can change it to anything you want. Aside from that, of course, you can also use TranslatePress to simply add a translation for your secondary language, whether they are for the original strings or your own version. However, you will notice that there are some strings that you cannot access in the usual way, namely anything inside a drop-down menu. If that is the case, you can still go the route via the menu on the side. Here, you find everything added to the page by plugins and themes. Go through the entire list so you don’t miss anything. Be aware though, that some strings only appear after you have taken an action. For example, after you add something to your cart, you get this message. Once it appears on screen, you can translate it like everything else, however, before that, you have no access to it. Keep that in mind so you test your site thoroughly for hidden strings. For the final part of this tutorial, you will need the aforementioned SEO Pack. It allows you to translate more technical aspects of your site that are important for search engines. When you have installed it on your site, the translation menu shows some extra options. Under Meta Information, you are able to translate both the post slug and page title. These are the last part of the product URL and the title that will appear in search engines and browser tabs. Translating them works the same way. Just pick the options from the list and fill in the information in the box for your secondary language, then save. After that, you will be able to see the new page slug and title in your browser window. 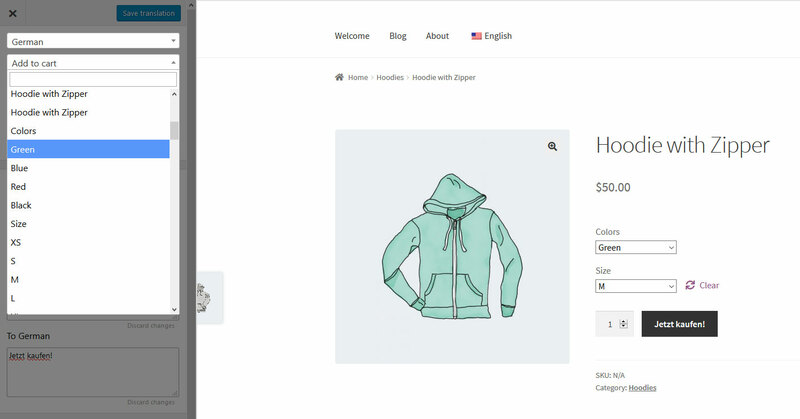 Knowing how to translate WooCommerce products is an important part of running an online shop. It helps you open up new customer segments and serve your clients better. It also allows you to compete in a global market and is a huge trust indicator. Above, you have learned how to translate key parts of your WooCommerce product pages with TranslatePress. From product titles, descriptions and categories over attributes, strings added by your theme or plugin and even the URL and title tag, everything can be translated in a matter of clicks. Plus, this translation tool is fast and won’t slow down your website. Armed with this knowledge, you are now able to create a truly multilingual WooCommerce store for your clientele. Do you have questions or comments about how to translate WooCommerce products? Let us know in the comments section below! You did a great job in providing an easy to use translation plugin! Much easier than Polylang that I have tried earlier. I find no problem in translating my posts from English to Chinese. Here, English is the default language, and Chinese is the second language. However, when my visitors try to search a post with words in Chinese, it turned out nothing! The search results for English words are perfect. Do I need to do something on my site to let visitors to search posts in the second language? Unfortunately the search in secondary languages doesn’t work right now because the content in the database is in the default language. We’ll need to add support for this in a future update, but for the time being we don’t have a workaround or quick solution for it. Thanks for your reply. I do look forward to your support for search in secondary language. Other than that, TranslatePress is so much better than other translation plugins. Please advise when support is available. Thank you very much!